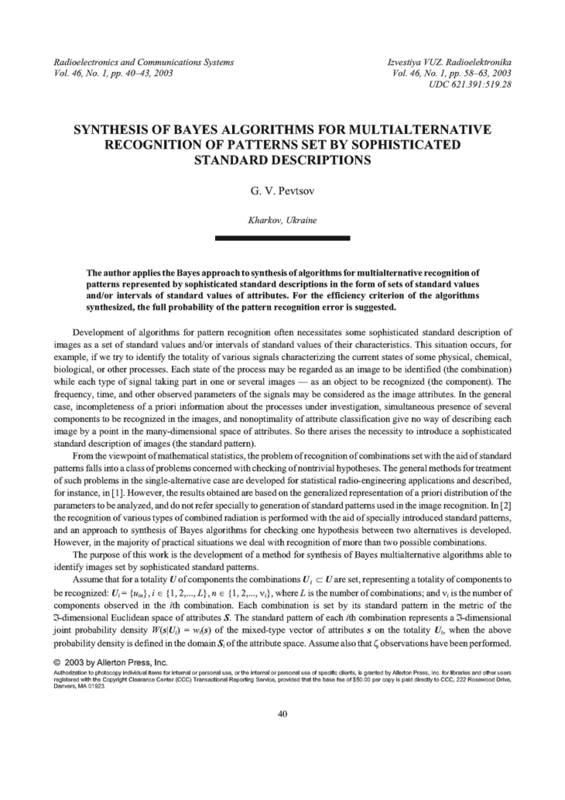 The author applies the Bayes approach to synthesis of algorithms for multialternative recognition of patterns represented by sophisticated standard descriptions in the form of sets of standard values and/or intervals of standard values of attributes. For the efficiency criterion of the algorithms synthesized, the full probability of the pattern recognition error is suggested. LEVIN, B.R. Theoretical Principles of Statistical Radio-Engineering, Book 2 [in Russian]. Moscow: Sov. Radio, 1975. PEVTSOV, G.V. "Synthesis of an algorithm for electromagnetic radiation recognition on the basis of the Bayesian rule of the complex hypotheses check," Izv. VUZ. Radioelektronika, v.41, n.4. p.49-57, 1998.